Produktinformationen "18s 18NLW9400 8 Ohm"
The 18NLW9400 is a 18" (460 mm) extended low frequency loudspeaker, designed for use as a low bass or subwoofer component, in vented or bandpass configuration. 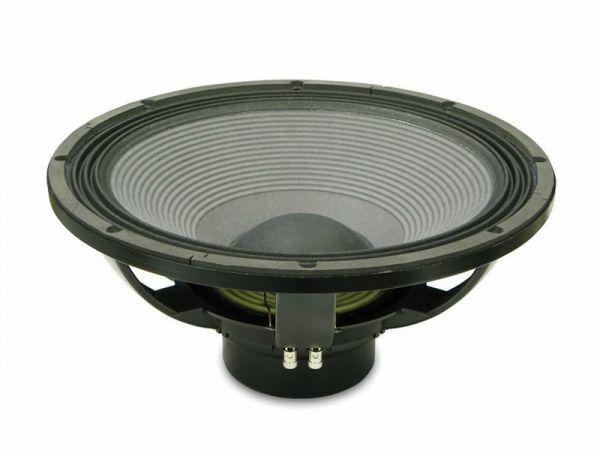 The loudspeaker design provides clean and undistorted LF reproduction at a very high SPL and enables the transducer to withstand high power levels without damage. For optimum results we recommend amplifiers able to deliver 2400 Watt program power. The high grade neodymium magnet assembly is able to resist to the most demanding environmental operative conditions. 18NLW9400 features include a large displacement suspension system which, in conjunction with a fiberglass reinforced, straight ribbed cone and the Eighteen Sound proprietary Double Silicon Spider (DSS) technology, allows an ultra-linear piston action and provides full mechanical control across the entire working range. The 100mm (4 in) copper round wire state-of-the-art voice coil, based on Interleaved Sandwich Voice coil (ISV) technology, provides high levels of thermal stability and durability. The ISV technology achieves a balanced linear motor unit exerting an exceptionally high force factor. This is realised through a high strength fiberglas former with half the coil wound half on the outside and half on the inside and bonded together using unique high-temperature resin adhesives. 18NLW9400 is able to perform properly under inclement weather conditions: the exclusive cone treatment improves pulp strength and gives water repellent properties to both sides of the cone. In addition, the special treatment applied to top and back plates of the magnetic structure is far more resistant to the corrosive effects of salts and oxidization. Weiterführende Links zu "18s 18NLW9400 8 Ohm"
Kundenbewertungen für "18s 18NLW9400 8 Ohm"